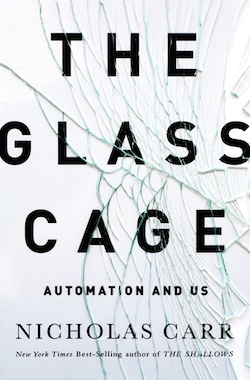 I recently read the book "The Glass Cage: Automation and Us" by Nicholas Carr and was inspired by his message of the growing advantages and dangers of technology, particularly pertaining to design and architecture. Carr says, "Technology is as crucial to the work of knowing as it is to the work of production. The human body, in its native, unadorned state, is a feeble thing. It's constrained in its strength, its dexterity, its sensory range, its calculative prowess, its memory. It quickly reaches the limits of what it can do. But the body encompasses a mind that can imagine, desire, and plan for achievements the body alone can't fulfill. The tension between what the body can accomplish and what the mind can envision is what gave rise to and continues to propel and shape technology. It's the spur for humankind's extension of itself and elaboration of nature. Technology isn't what makes us 'posthuman' or 'transhuman', as some writers and scholars have recently suggested. It's what makes us human. Technology is in our nature. Through our tools we give our dreams form. We bring them into the world. The practicality of technology may distinguish it from art, but both spring from a similar, distinctly human yearning."